Hurricane Michael, a powerful Category 4 storm, has made landfall on Florida’s Gulf Coast near Mexico Beach. As of 2:00 p.m. ET on Wednesday, the storm had sustained winds of 155 mph and a central pressure that makes it the third-strongest storm to ever hit the US. Michael is bringing heavy rain, life-threatening storm surge, and dangerous winds to the Florida Gulf Coast. The National Hurricane Center has issued hurricane and storm-surge warnings for parts of the Florida coast. 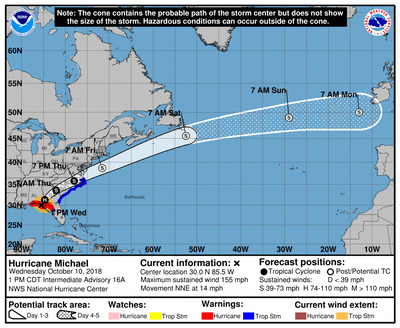 Hurricane Michael has made landfall near Mexico Beach, Florida as a major Category 4 storm with 155 mph winds. Michael’s low central pressure – 919 millibars as of 2:00 p.m. ET – makes it the strongest storm to hit the US since 1969. It’s the third-strongest ever, behind only Hurricane Camille and the 1935 Labour Day hurricane. Comparable storms include Hurricane Andrew in 1992, which had a pressure of 922 mb, and Katrina in 2005, whose pressure was 920 mb. Florida Gov. Rick Scott declared a state of emergency in 35 counties ahead of the Michael’s arrival. Some coastal counties, including Bay County and Gulf County, have been ordered to evacuate. Michael could bring a storm surge of up to 14 feet to some coastal areas, according to the National Hurricane Center’s latest update. “Life-threatening storm surge is expected along more than 325 miles of coastline, and the area of tropical storm force winds currently extend more than 300 miles across. PREPARE NOW,” the National Weather Service said on Twitter on Tuesday. As Michael’s eye moves inland, storm surge is likely to be the primary danger for coastal residents. The coastal area from the Tyndall Air Force Base to the Aucilla River is expected to see the highest storm surge, with 9 to 14 feet predicted. But life-threatening flooding is expected along the Panhandle, Big Bend, and Nature Coast areas. Hurricane warnings are in effect in Florida from the Alabama border to the Suwannee River. Storm-surge warnings are in effect from the Okaloosa/Walton County Line to the Anclote River. Storm-surge watches are in effect from the Anclote River to Anna Maria Island – an area that includes Tampa – and for the coast of North Carolina from Ocracoke Inlet to Duck. Tropical-storm warnings are in effect from the Suwanee River to Chassahowitzka, Florida; from Fernandina Beach, Florida, to Duck, North Carolina; and for the Pamlico and Albemarle sounds. Reuters has reported that evacuation orders and advisories affect 500,000 people in Florida alone. Scott implored those living in northwestern Florida to keep track of the storm and evacuate if necessary as it approached. Residents in that region who were not under mandatory evacuation orders were told to stock up on enough water, food, and medicine to last three days. Michael killed at least 13 people in Central America after the storm’s torrential downpours caused flash flooding, according to Reuters. Heavy rainfall from the storm is expected to bring similar downpours to parts of Florida, Georgia, and South Carolina. The National Hurricane Center describes wind as strong as Michael’s as potentially catastrophic. 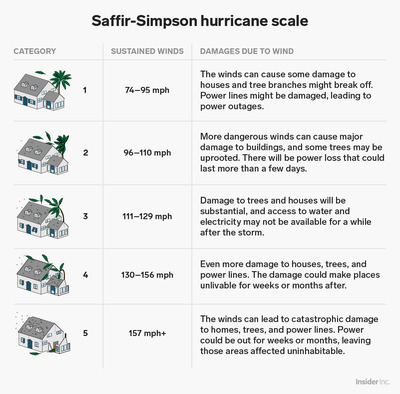 Wind speed is the basis for hurricane categories, and Michael’s storm’s sustained 155 mph winds make it not far from a Category 5 – the cut off between Category 4 and 5 is wind speeds of 156 mph. 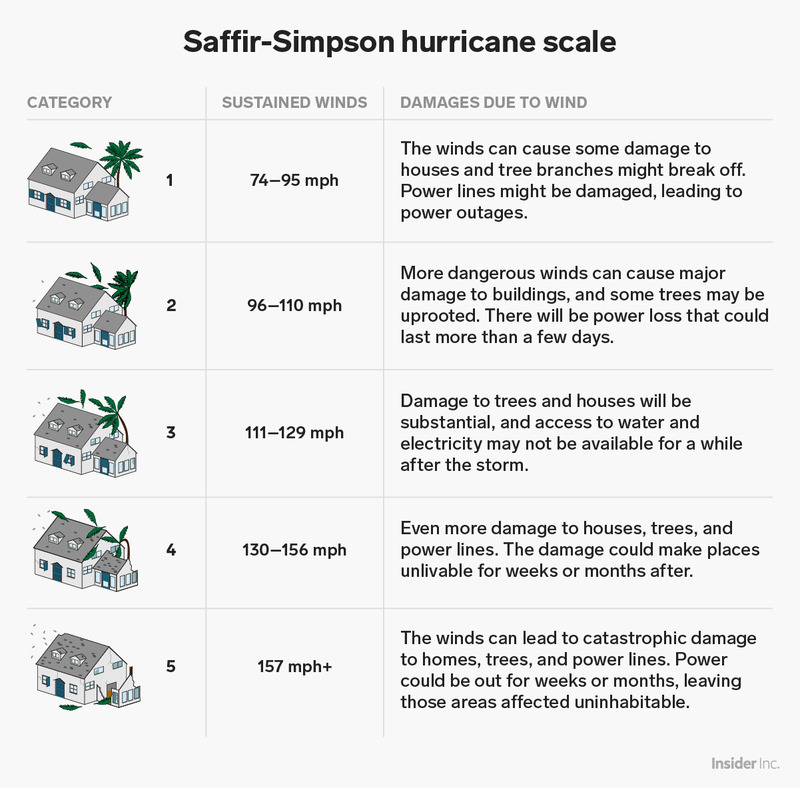 Samantha Lee/Business InsiderThe Saffir-Simpson hurricane scale ranks hurricanes by their sustained wind speeds. But central pressure is actually a better measure of the damage that a hurricane will cause than wind speed, according to a study published in the journal Nature Communications in 2017. Lower central pressure indicates a stronger storm, so this one is extremely powerful. Plus, with hurricanes and tropical storms, the biggest threat to human life is the water that comes from storm surge and rain-related flooding. In Florida’s Panhandle and Big Bend, southeastern Alabama, and parts of southwestern and central Georgia, residents could see 4 to 8 inches of rain, with a few areas getting up to a foot. That could lead to flash floods, the NHC warned. The region should brace for “major infrastructure damage,” specifically to electricity networks, wastewater treatment systems, and transportation, Jeff Byard, the associate administrator for the Federal Emergency Management Agency, told reporters on a conference call, per Reuters. The hurricane is now predicted to push inland, bringing heavy wind and rain throughout the southeastern US throughout the rest of the week. Ashley Collman, Sinead Baker, and Bryan Logan contributed reporting to this story.